For beginner gardeners, buying or building raised beds can be a really simple way to get started. Raised beds prevent weeds from growing, and you get to choose exactly what the soil and drainage will be without having to dig into the ground. If you are going to have your beds directly in the ground, lining the edges of the beds with some large rocks will help with weed prevention and will absorb heat from the sun during the day. This will also keep the soil warm after the sun goes down. Pick a spot that gets as much sun as possible, but is still within reach of your garden hose. 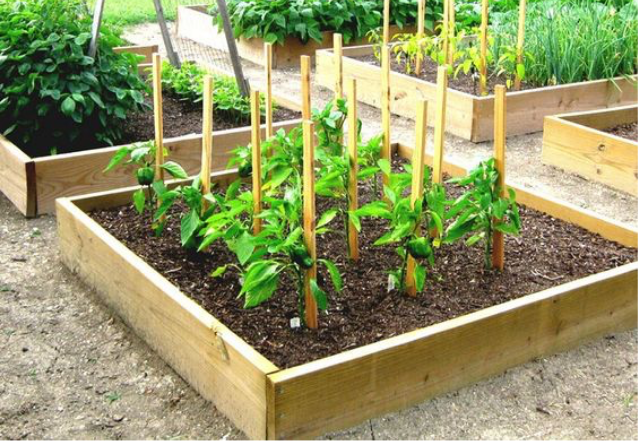 As soon as the frost has lifted and the soil is workable, start preparing your garden beds. You can use a soil test to see where your pH and nutrient levels are, which will tell you what type of materials you might want to add. Using a jar and some water, you can do a simple test to find out what percentage of sand, silt, and clay your soil is. The ideal composition should be about 40% sand, 40% silt, and 20% clay. Adjust by adding in whatever your soil may be lacking. Loosen up your soil, and remove any roots, weeds, and rocks. Mix in plenty of good quality compost; you want the overall ratio of soil to compost to be about 30/70. Add another inch of compost to the top of your soil. Finally, top everything with a layer of good mulch. When planning out your garden, it is a good idea to look into companion planting. This is a technique that takes advantage of the way certain plants benefit one another. Here are some good beginner-friendly plants that all work relatively well within the same beds. Each of your plants will require a different amount of space, depending on the way the roots grow and how tall they will eventually grow to be. Check what each of your plants’ space requirements are before setting them in the soil to prevent overcrowding your beds. It is best to plant in freshly dampened soil during the early morning or in the late afternoon. You will want to give your beds a good watering once or twice every day, again in the early morning or late afternoon, for the first couple of weeks. You can then decrease to once every day, or even less depending on your local weather. Now that you have your plants in the ground and growing, the real fun starts. The best part of gardening, aside from the harvest, is getting to care and learn about each plant. Take time each day to nurture your garden, relax and enjoy your new green space. Good luck, gardeners!